UV-3718 UVC Irradiance Detector is designed is designed to measure the irradiance of 254nm dominant UV-C low pressure mercury (germicidal) sources with a wide enough dynamic range so that both health hazard and effective UVGI UV Germicidal Irradiance can be measured. This detector is also useful in Eprom erasure units for monitoring lamp output. Its RADIN cosine diffuser made, band pass filter and UV-C photodiode are UV-C pre-aged prior to calibration to minimize degradation even in long term use under high level UV-C radiation. 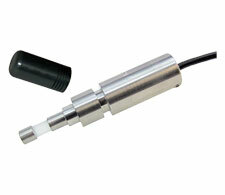 A flexible stainless steel sheath is provided around the detector cable to protect against UV degradation. The ROD-360-UV18 detector is designed to measure 254nm irradiance of UV-C light sources like low pressure mercury lamps over a wide dynamic range. Its ROD diffuser with 360� radial field of view, band pass filter and UV-C photodiode are UV-C hardened to minimize degradation. The detector can be used in both air and water sterilisation applications, Eprom eraser, UV-C pre-aging systems and medical equipment sterilization. 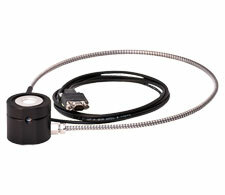 The detectors are supplied with a 2m long coaxial cable with selectable -1, -2 or -4 type connector for use with Gigahertz-Optik's range of optometers. Internationally traceable calibration & certification of UV irradiance in Wm� and W/cm� within the specified spectral sensitivity range is provided. UV Irradiance Detector ROD-360-UV18: 360 Degree F.O.V.